Water released from Lake Powell during flow experiments on the Grand Canyon in 2016. Photo credit: U.S. Bureau of Reclamation. View all of Todd Hartman’s stories. IT SOUNDS LIKE MORE RHETORIC, STILL THROWING TWIGS AT A CHARGING BULL, STOP CRISIS MANAGEMENT BE PROACTIVE, BUILD MORE RESERVOIRS. DAMN THE TORPEDOES , FULL SPEED AHEAD. WE NEED MORE PEOPLE LIKE HENRY J. KAISER, GORDON KAUFMANN AND FRANCIS TRENHOLM CROWE. YES, TWO FORKS RESERVOIR WILL BE A GOOD START, START TO BUILD IT NOW AND 50 YEARS FROM NOW OUR DESCENDANTS WILL THANK TODAY’S VISIONARIES . Time to actually “roll up your sleeves” and stop talking about it. In addition, living in the Denver Metro Area, it is painfully evident that we need to further enforce prudent use of water. We waste a lot of water! Thank you for keeping us informed. I find this topic fascinating and have been following your updates. I would love more information on the contingency plans in place and how they will potentially operate and what events will trigger them. Thanks for your interest Tina. We will continue to follow the drought contingency planning process and how it unfolds in Colorado and throughout the Colorado River Basin. One of Denver Water’s (DW) answers to this problem is to divert more water from the already depleted Colorado River by further draining the Fraser River (to virtually nothing). In the process, they seek to raise Gross Reservoir by 131 feet, without any hard evidence that there will be enough water to fill the dam or the gigantic hole that would be created. 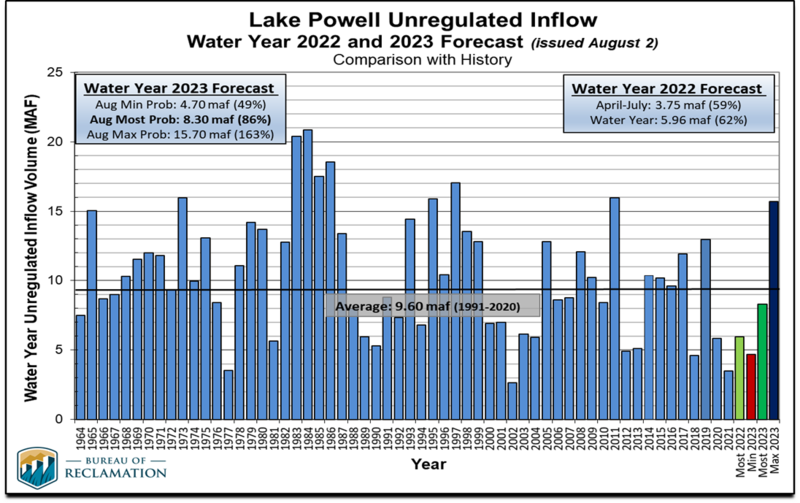 Meanwhile, climate scientists from CSU forecast that the Colorado River flows will continue to decline. When approximately half of Gross’ water is used to water lawns in Denver each summer, the time to reevaluate our relationship with water usage has arrived. Also, even as Denver’s population has grown by 10%, water usage in the city went down 20%, so the DW nutshell argument that water “needs” are increasing holds no water. Thanks for reading and for your comments Ben. You raise important issues, and more information about them can be found at our Gross Reservoir website. It includes information about environmental impacts and mitigation as well as answers to many FAQs about the expansion project. Although not an immediate answer, in 10-20 years once nuclear fusion power plants can be built to supply electricity to reverse osmosis desalination plants, maybe California can reduce in’s draw on the Colorado enough to restore Lake Mead. Unfortunately that would probably mean producing 2-5 million acre feet since only some of the additional water would be offset by reduced draws on the Colorado. Previous Previous post: Fixing big pipes requires big equipment, but where do you park it? Next Next post: Do you use only what you need indoors?